Following a crime, a victim's life can be turned upside down. The experience of being a crime victim can create different emotional, physical and financial responses from every person. Wendy Hay, Shiawassee County's Victim's Rights Coordinator is available to assist victims of crime through the criminal process. So is Smokey, the Shiawassee County Prosecutor's Canine Advocate. In 2013, the Canine Advocacy Program connected Shiawassee County with Smokey, the County's Canine Advocate. Smokey's job is to provide advocacy services to child victims to help alleviate the anxiety associated with being involved in the criminal justice system. 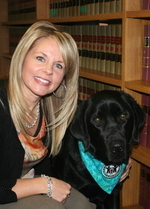 Our dog Smokey is skilled in assisting children in both courts and during the interviewing process in criminal investigation of child physical and sexual abuse. If you would like Smokey to be involved in a case in which a child may be called as a witness, please contact Victim Rights Coordinator Wendy Hay.